How do I layer my soap? There are a couple of ways to layer CP soap. 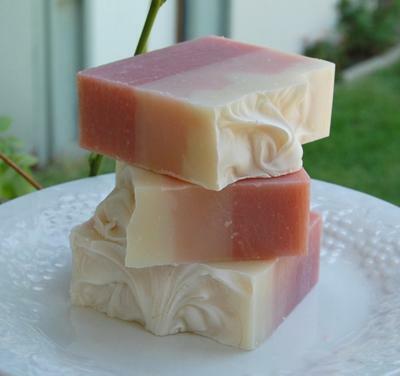 One method is to make a half batch of soap and pour it into your soap mold. While that is insulating, make another half batch of soap and gently pour that batch on top. You then insulate the entire batch as normal. Another method is to make one full batch of soap and, when it is at a thin trace, divide it into two bowls. With the first half, add all of the colour and fragrance and bring it to a full trace. Pour it into your soap mold. Then take the second half and do the same, adding all the colour and scent and then bringing it to a full trace. Once the second half has reached a full trace, you very gently pour the soap over the first half. The first method gives much straighter layers while the second method tends to have more free form layers. I tend to use the second method more often...for some reason I like the irregularity of them...every bar is different. First off I love this site....second your soap is so beautiful & I really hope this beginner can be as talented as you one day.Iv learned so much from this site thank you. I was wondering dd you get your soap so white & beautiful on the top? It looks so creamy. Cathy: Your layered soap is BEAUTIFUL! I have been making CP soap for 5 years and have never had the courage to layer. You have inspired me!! THANKS!